Call Me Enemy, the first in a trilogy of stories which closed Callan‘s fourth and final series, sees the return of the KGB agent Richmond (played by T.P. McKenna, who had previously appeared in the series four opener That’ll Be The Day). Richmond is, in some ways, Callan’s opposite and equal and this might be the reason why Hunter has decided to leave him in his care. We open with Lonely driving the pair of them down to a palatial country house, where Callan and Richmond will stay until their business is concluded. All the rooms are wired for sound, which means that every word is recorded and relayed to Hunter back in London. Richmond is well aware of this, hence his ironic toast “to the British taxpayer” as he and Callan tuck into a particularly fine meal (with some decent wine). For Hunter, listening to their exchanges back in London (and with only a sandwich) it’s rather galling! Jarrow (Brian Croucher) has been seconded to the Section to maintain the recording equipment. His long hair appalls the highly traditional Hunter, who’s astonished to discover that Jarrow was formerly a captain in the Royal Signals. Why is Richmond speaking to the British? He doesn’t want to defect, but he does want to fade away. Richmond asks Callan if he’s ever “wanted just to disappear. Have you never got tired of the whole business? Had just one wish, to forget and be forgotten.” He has something to sell. Whilst he has no intention of betraying his own people, he’s happy to reveal the identity of a mole within the Section. George Markstein had story-edited the first thirteen episodes of The Prisoner (he’s the man behind the desk in the title sequence) and following his departure from that series joined Thames as a writer and story editor. Apart from serving as Callan‘s story editor during the third and fourth series, he worked on several other series, including Special Branch, in the same capacity. 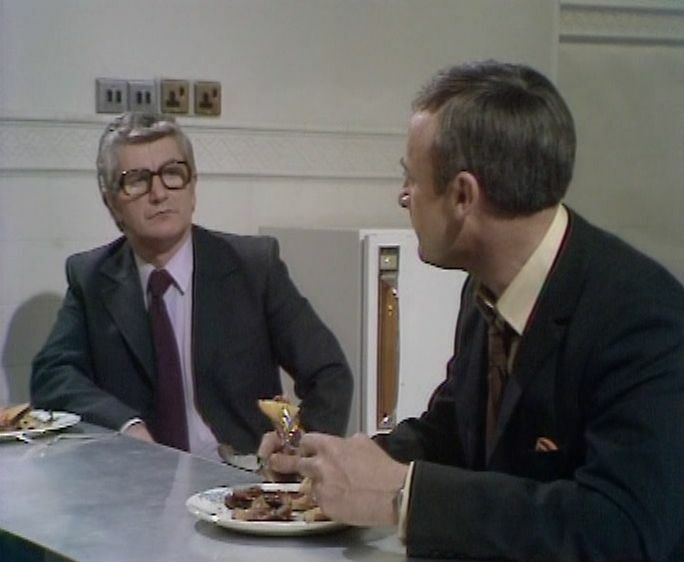 He always had an interest in spy and espionage stories (he would later write several episodes of the mid eighties series Mr Palfrey of Westminster, which had something of a Callan feel) so it’s rather surprising that this was the only episode of Callan that he wrote. Call Me Enemy is a character piece and it’s very much a two-hander with Woodward and McKenna both excelling. Richmond is an arch dissembler – he’s made a career out of lying, so how much credence can we place on his claims of there being a traitor in the Section? Possibly he’s only here in order to sow dissent and confusion. This seems to be working as he starts to needle Callan. Richmond claims to do what he does out of strong ideological convictions, whilst Callan does it because “it’s a job.” Richmond decides that Callan owes the Section everything. “Your father was on the dole, you never had a decent schooling. The army even took away your medal. You owe them a lot, don’t you?” This section of the story offers a brief insight into Callan’s earlier life (something that’s rarely been mentioned before) with Richmond asserting that the Section blackmailed him into joining. It’s notable that Callan doesn’t contradict him. We also learn something of Mere’s backstory. He was an officer in the Brigade of Guards, but was kicked out after the death of a private soldier. However, his father (a Lord no less) was able to pull some strings and ensure that he wasn’t court-martialed. Richmond names Meres as the mole and makes a compelling case. Meres’ sudden appearance comes as something of a surprise – has he come to silence Richmond, Callan or both of them? But it becomes clear that Meres is there with Hunter’s blessing. So if Richmond is playing an elaborate game it appears the Section is doing so as well, although Callan’s life is very much at risk. Hunter seems sanguine about this, but it’s telling that Bishop is much more agitated. He rates Callan as the Section’s best man and doesn’t want to lose him. In the closing minutes, Richmond asks Callan to defect. “For people like you and me, safety can only be found amongst our enemies. It’s our friends who will kill us.” They seem on the verge of leaving together, when Richmond knocks Callan out and escapes on his own. Meres congratulates Callan. He believes that Richmond hadn’t convinced Callan and so decided to cut his losses and leave. What does Callan believe? He seemed very keen to leave with Richmond – was this simply part of the plan, or did he genuinely see an exit? Like so much of the episode, it’s open to interpretation and this is one of the reasons why Call Me Enemy is an episode that only gets better with each rewatch.